« Is Online Poker Safe or Rigged? Poker comes in many different forms from Texas Hold Em to Omaha to less popular versions such as Razz, HORSE and Stud. Whatever form of poker you happen to be playing or desire to play, the objective of the game is the same. This is that you are striving to make the best five card poker hand. You can find out more about this great game by visiting the casino at Sun Bets. There are several main forms of poker in the world at this time. The two biggest games by far are Texas Hold em and Omaha Hold em. The game of Texas Hold’em originated many years ago but became hugely popular when it was the game of choice at the main event of the World Series of Poker. It is a fast paced game where each player is dealt two starting cards that are solely for use by them. Each player’s cards are unknown to the other players. There follows a round of betting and then the dealer reveals a further three cards. These three cards are placed in the centre of the table and are communal cards. This means that they can be used by all of the remaining players that are still active in the hand after the first betting round. These three cards are often referred to as the “flop”. There follows another round of betting. If there are still players remaining then a fourth communal card is dealt referred to as the “turn”. Another round of betting follows and then if there are surviving players, a fifth and final communal card is dealt (called the “river”) and a fourth and final round of betting followed by a showdown. Texas Hold em is a fast paced game due in large part to the fact that each player only has two of their own cards at the start of the game. So bad hands are more obvious and subsequently folded more easily. 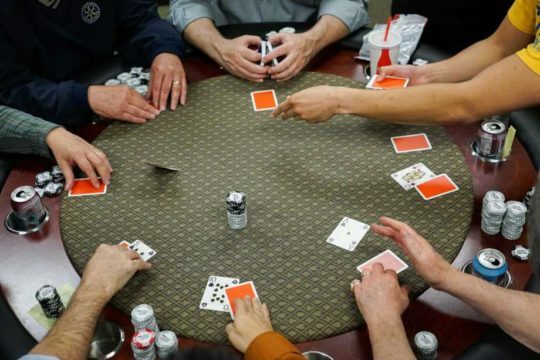 The bottom line is that each player has to make the best five card poker hand but has a maximum of seven cards to make it, five of which are shared by the players. Communal cards are a common feature in several poker variants including Omaha. Omaha Hold’em originated in Europe but has rapidly spread worldwide. It is played almost identically to Texas Hold em but with two major differences. The first one is that each player has four starting cards in their hand instead of two like in Texas Hold em. However it is the second major difference that often confuses novice players when they play Omaha. Each player MUST use two cards from their four card hand and three from the communal cards. There is no such requirement to do this in Texas Hold em. A quick example will highlight what we mean. If you have A-K in your hand at Texas Hold em and the final board reads 8-8-8-5-5 then you can declare a full house and play the five cards from the board. You cannot do this in Omaha. You MUST play two cards from your hand and three from the board. So if your hand is A-K-Q-J then the best hand you can make with a board of 8-8-8-5-5 is 8-8-8-A-K. This assumes of course that there is no possible flush. These two major differences are what really separate Omaha from Texas Hold em. Despite the popularity of Omaha and Texas Hold em, the next biggest poker variant is Video Poker. This is played at online casinos and live casinos all over the world. There are several major variants of video poker with one of the main variations being “Jacks or Better”. The objective of the game as usual is still to make the best five card poker hand. The caveat being that you need a qualifying hand of at least a pair of jacks or better to get paid. The player begins by entering their stake. Online Video Poker games allow players to only wager tiny stakes unlike live casino Video Poker games. After setting the stakes you are then dealt five random cards. You can then select to hold as many cards as you like or exchange as many as you like from one to five. So for example if you have say Qc-Qd-4s-3h-2c as your first five cards, you would “hold” the pair of queens and exchange the other three cards. You would be hoping to make a pair of queens or better. Each hand is paid out based on a pay scale with a pair being the lowest and a straight flush and Royal Flush being the highest. So why not go along to the casino at https://www.sunbets.co.uk/casino/ and play this great and ever popular form of poker?